No matter what your generational representation, you have likely heard the phrase, “Loose Lips Sink Ships,” coined during World War II as part of a general campaign of American propaganda to warn servicemen and other citizens to avoid careless talk concerning secure information that might be of use to the enemy. So, might you ask, what does this have to do with associations? With any long-term client affiliation, the association staff working with that association develops relationships with members and, particularly, those members in leadership positions with whom staff is apt to have frequent interactions. Those client-staff relationship can often move beyond discussion of the day-to-day operations of the association into more personal conversations on family activities, birthdays, weddings or vacations. So far, this is fairly benign. But what about the member who wants to talk with you about a negative interaction or exchange with another member? Your antenna should go up … but does it? It’s easy to get pulled into negativity. Perhaps you also have had a similar negative response to that same member, or even another member. And since you are intimately sharing information already, it’s easy to add to the conversation with your own experiences with members, all of which seems most innocuous at the moment. The funny thing about relationships, however, is that a riff in the relationship between two members can be resolved almost as quickly as the initial grievance occurred, and a few months later those two members are suddenly congenial and conversive and you are hoping your negative comments are not remembered or, at the least, not being repeated. Suddenly the confidential relationship you thought you shared with that member or board member is in question. Might your “loose lips” comments be shared with other members of leadership? The board president? Your immediate supervisor? How might that impact the client’s perception of your management company and its ability to maintain appropriate levels of confidentiality? You are starting to sweat and so you should be. The advice is quite simple. Do NOT under any circumstances allow yourself to be drawn into negative conversations about any association members. If you find yourself a party to such a negative conversation, excuse yourself and make a hasty retreat. You can politely and professionally suggest that any problems between two or more members be directed to the association president for action. 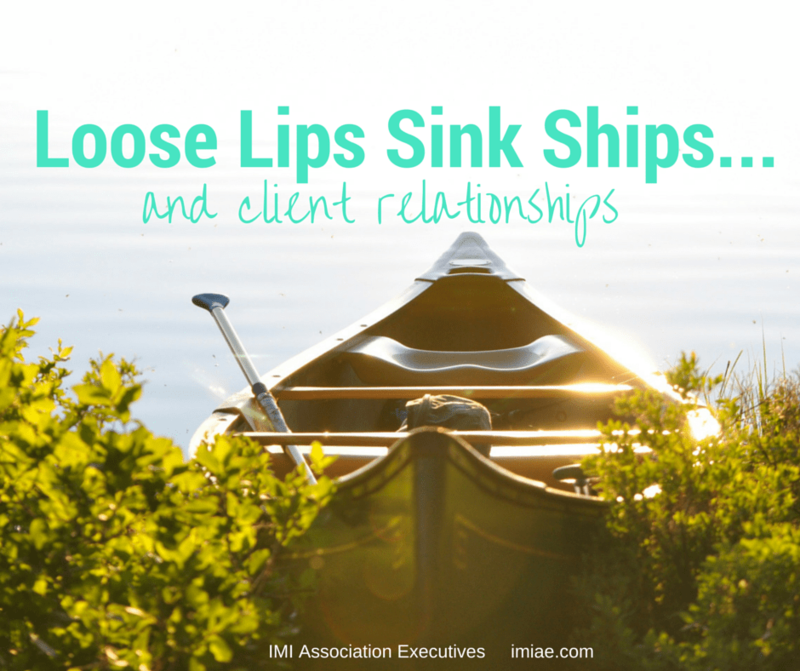 Don’t let your “loose lips” be the reason your management company loses a client or you lose your job.